In my previous blog Two approaches to create Code List in Cloud Studio I introduce two different approaches to build Code List via Cloud Application Studio. Both solution will finally create dedicated data type under the hood for Code List. In this blog, I will introduce the third approach to build a kind of dynamic Code List without using dedicated data type. Dynamic Code List means for the same BO, instance A could have drop down list for example 1,2,3 and another instance B has list as A, B, C. In productive scenario this dynamic behavior could be helpful if you would like to achieve that different BO instance has different Code List based on their transaction type for example. The main idea of this solution is to use a dedicated Business Object serving as the data source of the Code List defined in a Hosting BO. So we have to create these two BOs separately. Activated the BO and create the corresponding UI. 2. Create a host BO, which should have one field holding the reference to the corresponding Code List BO. Within this BO, define an association to Code List BO. 3. In the Thing Inspector UI of the host BO, create a new Data List and bind it to the CodeList node in BO model. 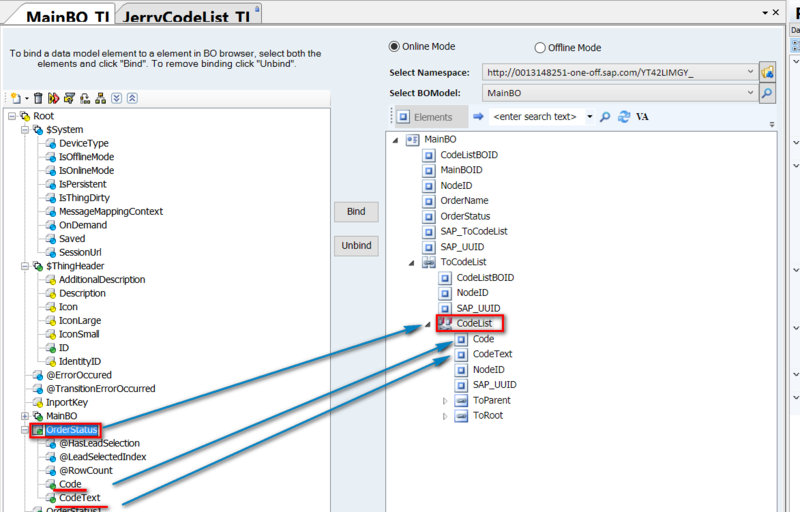 Bind data field Code and CodeText accordingly as displayed in the screenshot below. The OrderStatus field in Data structure should be bound to BO field OrderStatus as well. And the CCTS Information and CodeList properties for the data field should be set as below. The last step: bind the UI element to the OrderStatus field. Thanks Jerry! Very useful blog.